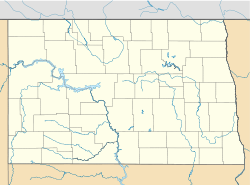 East Fairview is a census-designated place and unincorporated community in McKenzie County, North Dakota, United States. Its population was 76 as of the 2010 census. The community is located on the North Dakota-Montana border, which separates it from Fairview, Montana. ^ "East Fairview". Geographic Names Information System. United States Geological Survey. ^ United States Census Bureau. "Census of Population and Housing". This page was last edited on 14 January 2018, at 22:21 (UTC).